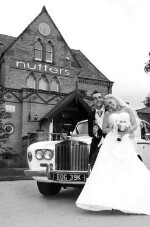 Based in Bury Lancashire covering Weddings across the north west. Classic Collection offer a professional and personal service providing pure luxury and style at an affordable price. Choosing a car for your Wedding can be a daunting task, you may be driven by Budget or Style, you may want a vehicle to match your wedding theme. Whatever your criteria for choosing your wedding car we aim to provide you with the knowledge needed to succesfully supply the Wedding car of your Dreams. All our vehicles come with a fully uniformed Chauffeur, a choice of silk ribbon to match your colour theme and flowers in the rear. Classic Collection offers a profesional service for your perfect Wedding day. Enjoy a complimentary bottle of Champagne after the ceremony as you are driven to your reception.